Infiniti executives are taking pains to ensure that their luxury version of the electric Nissan Leaf hatchback will be markedly different and more upscale. This year, U.S. officials of Infiniti reviewed initial designs at Nissan's San Diego styling studio and complained that they simply looked like another version of the Leaf, say people who were there. The United States will be the Infiniti model's largest market. Ben Poore, vice president of the North American Infiniti Business Unit, says more recent designs have corrected the problem. "I was in Japan last week and saw the final three or four designs for the car," Poore says. "And I can tell you without a doubt that we're going to have a uniquely Infiniti product." Nissan recently announced that it would retail the Leaf, which goes on sale in the U.S. in December, for about $25,000 after government incentives for alternative-fuel vehicles are applied. Infiniti has not said when its electric vehicle goes on sale, although it's probably an additional two to three years away. Larry Dominique, North American vice president for Nissan and Infiniti product planning, says the Leaf and Infiniti will share a platform. "And yes, we're going to share a lot of the drivetrain components," Dominique says. "But we think it needs to be very unique, not only in exterior design but in interior materials and in terms of its driving performance. It has to accelerate like an Infiniti. It has to be an Infiniti from the standpoint of dynamic performance. 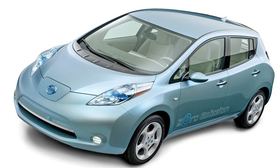 "The Leaf will be a great vehicle, but it's very clearly Nissan. The Infiniti version will have to be purely Infiniti."